That’s the only way to describe what happened in Thun. In all, six new world champions were crowned. In Men’s K1, Nick Troutman stole the crown from EJ with a whopping 1,500-oint ride in the finals. In OC1 it was the USA’s Jeremy Laucks; in C1 it was Great Britain’s David Bainbridge; for the Jr. Women it was Noria Newman from France; in Jr. Men, the USA’s Jason Craig won every single heat; and for the K1 Women, it was Troutman’s new wife and EJ’s daughter Emily taking the gold. “In the fials there was a stacked heat of close friends, but I was lucky enough to take the title for Canada,” says new kayak king Troutman. After ripping up the Big Air Ramp, Troutman continued to do so in the finals, besting father-in-law EJ by more than 500 points. In all, Troutman scored 1,510 points on his ride, compared to EJ’s 958. Followng in third was Stephen Wright with a score of 790, Jules Gallans with 466 and Joel Kowalski with 410. It’s a good thing Troutman already asked EJ for his daughter’s hand in marriage. EJ’s daughter, Emily, meanwhile, kept up the Jacksons’ winning ways, taking the gold with a 553-point ride over previous women’s world champ Ruth Gordon of Canada, who finished with a score of 348 to take second, despite leading the pack after the preliminaries. Australia’s Tanya Faux nabbed the bronze with 340 points. “Well yesterday were the finals…We had 5 days of narrowing down the classes. It was an amazing day for anyone competeing or watching. The crowd was huge with a couple thousand people cheering; it was really loud. There were TV cameras everywhere, live footage on TV’s all over the event, and a Big Screen to watch on the banks. There was music blaring, and excitement in the air. The win by Troutman came as no surprise, based on his earlier results in the prelilminaries. 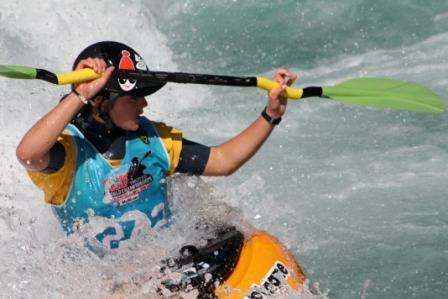 Troutman destroyed the wave and fellow paddlers in Thun with rides scoring more than 1300 points as the event got under way. Troutman led the entire men’s delegation of Canadian paddlers into the quarterfinal rounds with blistering rides full of huge air screws and was among just a handful of men successfully throwing down McNasties. Troutman’s score of 2480, comprised of the best two of four rides, was more than 800 points ahead of the next highest scoring competitor, second place Slovakian Peter Csonka with 1613 points and nearly 1600 points ahead of defending World Champion Eric Jackson of the USA. Lluis Rabaneda, Chair of the ICF Freestyle Committee said 14 countries and four continents represented by 30 paddlers demonstrates the increasing depth of talent developing in freestyle paddlers around the world beyond powerhouse countries like the USA, Canada and Australia. While the weather might have been less than spectacular at the event, the Juniors at the International Canoe Federation Freestyle World Championships certainly were. Four divisions competed in intermittent rain during the 2009 edition of this event going on in Thun now through Sept. 6. Perhaps the most amazing feat of the day was achieved by Jason Craig, Team USA junior men’s competitor. The 16-year-old’s score of 1708 would have landed him in second place in yesterday’s senior men’s division, behind Canada’s Nick Troutman and ahead of Slovakian powerhouse Peter Csonka. Nine of the 10 semifinalists in junior men scored well enough to have also made the Top 30 quarterfinal cut in the senior men’s division, prompting ICF Second Vice President Richard Fox to comment that the future of freestyle seems secure and bright. A shining light in the junior women’s division was France’s Nouria Newman. Newman’s 418 point ride eclipsed second place Sandrina Hornhardt from Germany who tallied 130 points. Also scoring more than 100 points was third place Leoni Haberling of Switzerland with 115 points. After the scores were posted, Newman, who also competed in 2007 Worlds on Canada’s Ottawa River, sagely said it’s fun out there but there’s still a long way to go in the competition. The top 10 junior men and junior women from yesterday’s prelims advance to semifinals on Saturday afternoon. Another notable performance included an impressive 1013-point ride turned in by Canada’s Guillaume LaRue in the C1 class. Women’s K1 prelims held few surprises as wave riding action continued with 43 of the world’s top female paddlers battling out for the top 20 spots to advance quarterfinal competition, with defending World Champ Ruth Gordon racking up 713 points in defense of her title, which would have bested Emily in the final round. The only upset of the competition came when former World Champ, veteran German paddler Jutta Kaiser, failed to advance out of prelims, just barely missing the Top 20 cutoff by three points.